Story and Logic Media Group: It's All About Verbs!! Write is a verb. It is an action word. 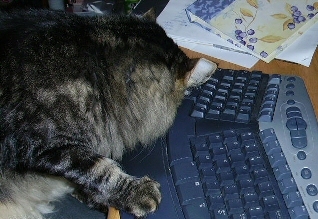 What it means for me as an author is putting my hands on the keyboard and weaving words into an entertaining plot. There are times writing is a thought process. Thinking about characters, plots, scenes. Think is a verb. Sometimes I read to get ideas and to learn more about writing. Read is a verb. I'm a writer. My actions produce messages of hope and inspiration to those who read my words. I am also a Christian. Being a Christian requires me to love. Love is a verb, too. It’s not just a word I speak to others, not just a word I write. To really love takes an action on my part. It’s what being a follower of Jesus means. Loving others without thinking of rewards. 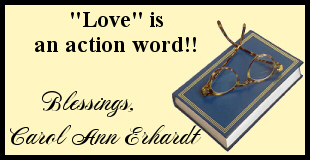 Prayer: Dear Lord, let me go through the day remembering that love is an action word. Let me be a blessing to others in my words and deeds. Let me love like Jesus. Amen. My action verb for today? Work. Work on my relationship with Jesus. Thanks for the message, Carol Ann.